Continuing our survey of the best Bluetooth headphones, this time with an in-ear design for versatility and freedom, we’re met with some pretty high-end stuff here today. In-ears are preferred by many, including us, for various settings — exercise, travel, a walk in the park or beach, or really any environment you can think which you’d prefer a more personal listening experience as compared to some over and on-ear pairs of headphones with a pesky headband or clunky overall build and weight. 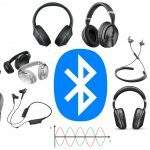 Bluetooth is becoming more advanced as technology grows, so having a wireless BT pair in particular will give us even more flexibility to listen to our tunes, shows and movies. 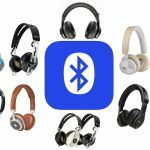 We took a lot of time to compile this list and tried to diversify our picks as much as possible to cover the broad range of our readers, so let’s get into how we feel you can find the best Bluetooth in-ear headphones for you today. We’ve steered towards providing our favorite “10” models since in our experience of writing about gear for nearly 5 years now, not everybody fits into the mold of just one “best” pair. Especially in the headphones world, there are just way too many models to choose from, so narrowing it down for us has always worked best. The biggest factor of really any purchase ever is money, so keep in mind your budget for Bluetooth in-ear headphones. Are you needing a pair just under $100 in the lower-end? Or can you afford to grab a pair up to $200-$300 for some extra convenient features and higher quality build and sound resolution? Perhaps you’d like to save up after finding a solid pair, otherwise, we have all price-points below. 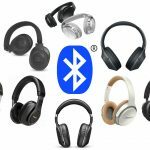 Next for Bluetooth headphones, we always recommend keeping an eye out for both Bluetooth range and battery life. Some wireless headphones, in particular in-ears, go all the way to 15 hours plus of playing time, while others can hit 8 or below. Unlike Bluetooth on-ear and Bluetooth over-ear headphones, It’s hard to pack in a big battery to support a long playing time in in-ear headphones right now unfortunately, but it makes sense. The longest isn’t always the best of course, and typically those which play longer can cost a bit more, so depending on your need and access to charging, the pair “best” for you may not entail much cash directed in this realm. At the same time, if you’re like us and don’t like to hassle with charging (we even forget sometimes and get to the gym with dead headphones), go with safer bet and grab a high-hour pair. In terms of range, most are pretty feasible if you’re one to steer away from your music playing device. The average here is about 30 feet. Lastly, what we call “extra features” here makes or breaks a purchase in the best Bluetooth in-ear headphones department. This is when individual needs really comes in to play, since for example we know others who always spend extra money on noise-cancellation while others could care less about fancy tech (it’s pretty functional, for the record). Here are some popular “features” headphone brands like to include in their pairs, which typically does increase price, although it may be worth it for you: noise-cancellation, control center (play, pause music or even answer calls with a built-in microphone), color choices, and perhaps ear fins attached to the top (for support, most popular for those who exercise). Coming in as one of the heavy-hitters in the noise cancellation world, Bose’ “Quiet” series tackles Bluetooth capability with high sound and build quality on top of it all. These headphones are designed to be lightweight, easily portable, and free to give you flexibility to move through their convenient wireless build. The built-in ANC is why the price is so high, and it actively works to cancel external noise by adjusting to whatever environment you are using them in, while the in-ear design works to act as a seal between your audio and the sounds of the outside world. The ergonomic headband may not be what many would ‘envision’ an in-ear pair as and it may become annoying for some as it rests at the back of your head, but the ANC needs to be built-in somewhere. It’s made of soft materials and is very light weight however, so you’ll get used to it. Exercising may be a bit annoying here, but for travel and other settings, these are perfect. There are also some advanced drivers built-in with volume-optimized EQ, as well as a built-in mic with control center to skip through tracks as well answer calls with the push of a button. Lastly, the BT range is about 33 feet while the catch here is a playing time of only about 10 hours (ANC really eats up battery, so you’ll have to sacrifice that). However, with an app designed to give you customized control into the setup of your sound, it’s easy to create a personalized and unique listening experience as well. 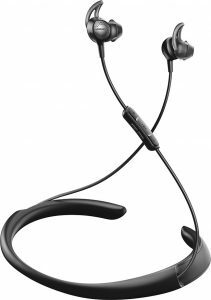 With reviews praising the quality of sound and comfort, the Bose QuietControl 30 headphones are one of the best Bluetooth in-ear headphones in the market today if the overall combination of features fits your vision. One of the biggest pet peeves when it comes to headphones is that may feel their sound is not balanced between each of the ear pieces. One seems to be doing all the work while the other is just “hanging out”, so to speak. With the SE425-CL by one of our favorite brands in Shure, the drivers located within each ear work to ensure that this does not happen, and that you are receiving an overall balanced and accurate sound while you are listening. What really ups the price here however is the sound quality, and you’ll be getting what you pay for — these dual high-def drivers (most have just one driver, especially in lower price-points) for a very natural and detailed sound. Dual means two, and there’s actually a dedicated tweeter and woofer inside of these little things for distribution to both the low and high-ends. Whereas many other headphones just have one for blend it all in, Shure’s pair ups the price for a better picture of your sound. You’ll be paying more for sound quality here, so if you weren’t concerned with ANC but instead raw sound quality, this is your pair of the best Bluetooth in-ear headphones. Lastly, the design of the Bluetooth in-ear headphones is the classic and comfortable fit with no headband in the way, which helps to keep your in-ear headphones in place while you are in movement (as a runner, this is especially helpful to the workout enthusiast). 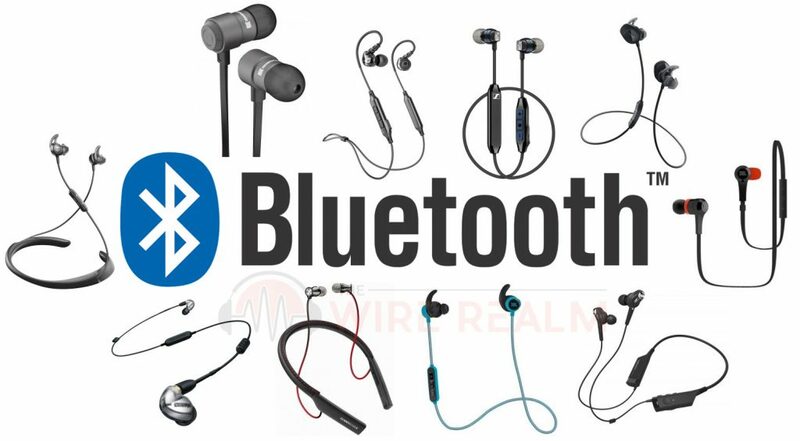 Additionally, the ear pieces are connected to your device via Bluetooth and come with the capability to answer phone calls and give voice commands without having to lift a finger. 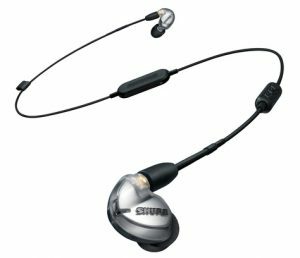 A variety of in-ear sizes Shure gives us in the box let you customize the headphones to your comfort level, and an included carrying pouch makes it ideal for those on-the-go situations. 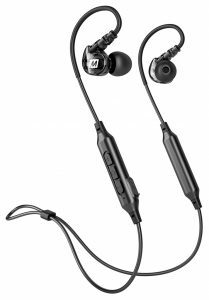 Plus, add in that it is compatible to nearly every device available and it’s easy to see why the Shure SE425-CL headphones are the best in-ear Bluetooth headphones in the market today, especially if you’re concerned with sound. You have 30 feet of range here however unfortunately only about 8 hours of playing, but if you can get by charging this after using them at night you’ll be fine. Recently, I have started traveling more than I ever have, and much of that has, of course, included many days and nights stuck on an airplane attempting to get comfortable while still knowing that may be a fight I will never win. 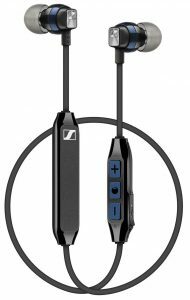 Comfort, however, is one of the boasting qualities of the Sennheiser HD1 in-ear headphones, which make it one of the best in-ear Bluetooth headphones in the market especially if you’re on-the-go. The design is different from the typical headphone in that the earbuds are connected to a neckband like the QuietControls; however, this neckband is where all the power lies in these headphones. The comfort of the sheepskin lining makes it easy to not only wear these headphones throughout the day, but also to lean against them without worrying about experiencing any irritation. 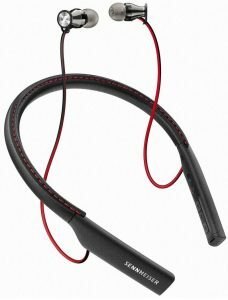 The neckband also houses the controls to adjust the volume, as well as a one-stop button that automatically connects you to your Bluetooth device. A vibration within the neck-band will let you know when someone is calling you, while the built-in microphone lets you make all of your call hands free. These headphones even prompt you with voice activation to let you know when your battery needs to be charged and to what device you are currently connected. 10 hours of battery life here with a standard Bluetooth range. A high quality option at a reasonable price, the Sennheiser HD1 In-Ear headphones provide all the necessities for the optimal listening experience, especially for those frequent plane riders. If the previous few picks were a bit too high in price, we’ll bring you back down to a cheaper pair without all of the pizzazz that gives us a simple wireless, reliable pair of in-ear headphones. While I enjoy upgrades and the latest technological advancements as much as anyone else, sometimes it’s the simplicity and recognition of easy use that really catches my eye. That is what the JBL J46BT wrap around headphones offer, with the classic design of adjusting your volume and skipping, playing, or pausing your music just a click away right next to your ear. 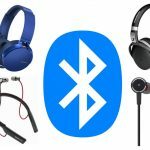 These headphones easily connect to your device via Bluetooth however can last for about five hours by being charged with the included USB. Plus, they come with three different sizes of ear pieces to ensure that you are able to make them as comfortable as possible as you move through your everyday life. 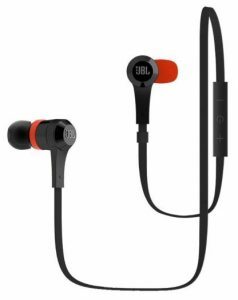 Add in the fact that the JBL J46BT come in three different colors that gives you a personal flair, and the JBL headphones speak for themselves as one of the best Bluetooth headphones available if you needed a simple solution to buy. Another high-end active noise-cancellation pair here but this time by another one of our favorite brands ever. I know that there is a saying that goes “less is more”, but in the technology industry today I believe they have ignored this saying to create their own motto of “more is better”. At least, that’s what I think of when I look at the features for the Audio-Technica ATH-ANC40BT wireless in-ear headphones, which come with the capability to pair with up to eight different devices through Bluetooth connectivity (do I even have eight different devices? who knows!) that you can use simultaneously, with your audio fluidly changing with whatever device you choose. To ensure that no external noise makes it through the barrier of your audio, these headphones contain a tiny microphone and a noise-canceling wave within each of the in-ear pieces that reduces all external noise so that you can focus on the audio of your choice. Now, while all of these features are captivating, I personally go old-school and appreciate the fact that while these headphones are hands free, the maker understand that not all areas are receptive to Bluetooth device. Therefore, a classic connector that is compatible to most devices is included to make sure that your headphones can also be used in any situation. So yes, while the “more is better” saying definitely applies to these headphones, we think what makes the ATH-ANC40BT one of the best Bluetooth headphones on the market is the inclusion of practicality over flashiness. High quality, budget friendly price (very cheap cost), and designed specifically for those with an active lifestyle? The mEE Audio X6 Plus are the Bluetooth in-ear headphones that have dialed in to this model precisely, creating a sweat-resistant design that has the flexibility and durability to handle a range of activities. The over-the-ear design with comfortable ear hooks that form well to ear individual ear size ensures that these headphones will stay in place throughout any movement, while maintaining a hands free capability through the use of Bluetooth. This means you are also able to answer your calls and control your volume and playback while still maintaining the activity you are engaged in. Plus, these headphones have staying power, promising to last through a little over six hours of continuous music and seven hours of conversation. With four different sizes of ear tips included, it’s easy to find your perfect fit to make sure they stay in place without slipping out (a problem we know all too well). A high quality option that is great for the price, the mEE Audio X6 Plus is for those on-the-go lifestyles who are looking for functionality in their everyday life without breaking the bank. What’s a headphone guide without a Beyerdynamic appearance? 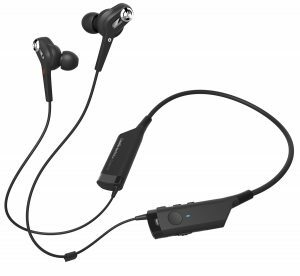 The first wireless in-ear headphones to be created by Beyer, the Byron BT are the wrap around Bluetooth enabled headphones that offer precision in their delivery of sound while cancelling out any external noise you may be avoiding. Built to work with Apple and Android devices, these headphones contain three buttons that easily let you control what is being played and the volume it is being played at. Built in microphones let you continue to be hands free when answering your calls, and with seven and a half hours of battery life you have a decent amount so you don’t have to worry about consistently replacing the battery for continued use. Three different sizes of ear tips made of silicone make these headphones not only comfortable but stable when wearing them, giving you security that while you’re in motion your headphones won’t be falling out. This brings a nice balance of high-end build and sound quality at an affordable price, and the drivers here a bit more advanced than others in its competitive price-range. You have something called Qualcomm aptX codec, a popular technology included in some wireless headphones that aids in the strength of transmission of sound via wireless Bluetooth to retain the richness and detail of audio. Great for the price and well reviewed, the Beyer Byron BT headphones provide precision and clarity of sound over fancy features. Lightweight, portable, and barely noticeable with its subtle design, the CX 6.00 BT in-ear headphones offer a clear and balanced sound with a decent battery that will keep your audio with you for at least a days worth of activities (six, to be exact). These headphones are able to pair with two different devices depending on what is in use, and keep you hands free with the built-in remote. This remote allows you to answer and control your music with a simple click. An automated voice reaction will also tell you when it is time to change the battery in your headphones so you’re never kept guessing as to when the need may arise. Additionally, the Sennheiser headphones work well with even gaming devices, ensuring that there is no delay between the game and your audio, keeping you up to date on everything that is happening and letting you stay “zoned in” on what you are working on. 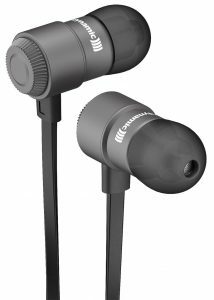 Complete with a carrying case and various earpiece sizes for comfort and fit, the Sennheiser CX 6.00 BT demonstrate one of the best Bluetooth in-ear headphones at a budget friendly price by a reputable brand. Colorful, portable, and light in design, the JBL Reflect Mini Bluetooth in-ear headphones are designed for athletes who will be using them on the go, both during the day and night. The “reflect” in the title refers to the reflective capabilities of the cable, making sure that you are seen and safe in all situations, a big plus for you night runners or cyclists. 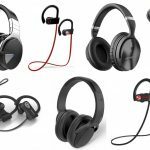 They are also “mini” in size compared to the other headphones on this list, which keeps them out of your way during any kind of activity and giving you the freedom to move in however you need or want to. The headphones are designed to last for up to eight hours, and take the guesswork out of your audio by giving you accessibility to one button for both your music and your microphone. Also, keeping in mind that these headphones are made for an active lifestyle, the microphone is wind resistant to make sure that all of your calls are clearly received, and the headphones themselves are sweat proof to keep you from worrying about them breaking as well as the inevitable “slip and slide” that so often happens with headphones. 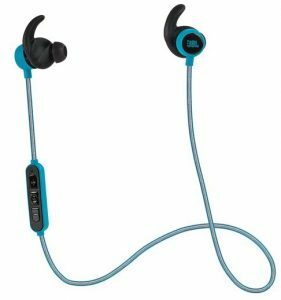 Known as the smallest design available from the JBL brand, the Reflect Mini BT headphones are the best in-ear Bluetooth headphones for all types of vigorous activity, although they’ve gotten some poor reviews lately due to the sound quality, we’d buy these for the exercise-friendliness in the end. We find it quite fitting that this list is both starting and ending by looking at another option from Bose, only this time we are examining the SoundSport Wireless. 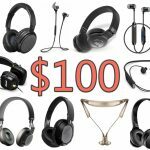 The difference between these headphones and the ones that were discussed previously? Aside from the noticeable cheaper price, this device follows in the footsteps of the previous headphone in that it was created for an active lifestyle, and meant to hold up well through all types of exercise activities. The wing design of the ear piece is supposed to help keep the headphones in place without them ever falling or slipping from the ear canal if you’re exercising or bumping your head too hard during your current track of choice. The resistance to sweat and weather conditions keep them work in a variety of situations, and the lightweight wrap-around design makes sure you are never fighting with any annoying chords that distract from your workout. It’s the pulse sensor, however, that we think really makes these headphones stand out in a crowd. When connected to the Bose app, these headphones will monitor your heartbeat and update you to help the user stay on track or know when to push it up a notch. 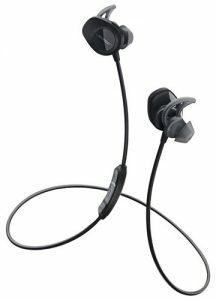 Providing clarity in your sound and promising to be your best work out companion, the Bose SoundSport Wireless headphones strongly finishes our list of the best in-ear Bluetooth headphones available in the market today.